On Sunday mornings I love watching Indian music videos on Namaste America. I have absolutely *no idea* what the performers are saying, but I love the costumes, choreography and Bollywood style. Indian-themed makeup has been all the rage lately (Givenchy Sari collection, anyone? ), and now it’s Stila’s turn. 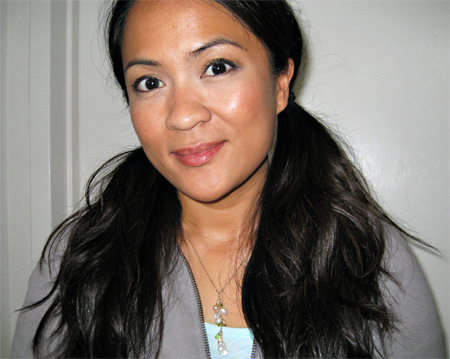 With shades of gold, bronze, pink, plum and teal, Stila’s Summer 2009 collection goes on sale this May. My girl Saniya at I Heart Makeup has more of the deets on the launch. From the few items I’ve seen so far, Summer 2009 is rockin’ my boat. The Charmed Eyeshadow Quad and the 24 KT Smudge Pot in Golden Noir are my favorites, but I also like the 24 KT Glosses, Mango Crush Lip and Cheek Stain and Marigold Duo. Isn’t Charmed Eyeshadow Palette’s packaging cute? How about the bindi appliques and matte gold compact? 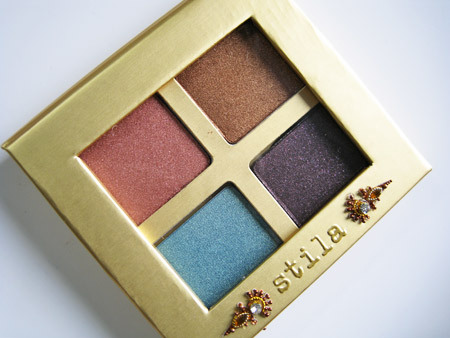 The four shades of deeply pigmented and shimmery bronze, dusty rose, eggplant and teal look just as elegant on the inside as the packaging looks on the outside, and I think Stila thought ahead because the colors go well with the Smudge Pot in Golden Noir. Be prepared to handle the quad with kid gloves, though, as the bindi decorations fall off easily with just normal handling. It’s just as delicate as it looks. Golden Noir applies as a deep, true black infused with golden glitter — sooo pretty! As I sit here thinking, I don’t know if I’ve ever seen anything like it before. I wouldn’t be surprised if it sold out early. 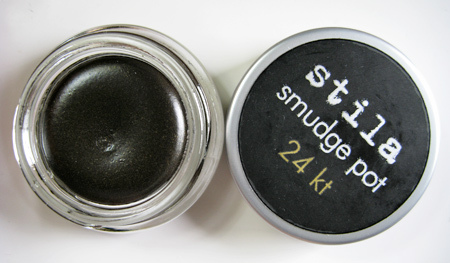 The Stila Smudge Pots are creamy gel liners that double as eyeshadows. I can easily see myself wearing Golden Noir daily in the summer. Like the eyeshadow quad and Golden Noir, the creamy bronzer/highligher duo is packed with rich color. 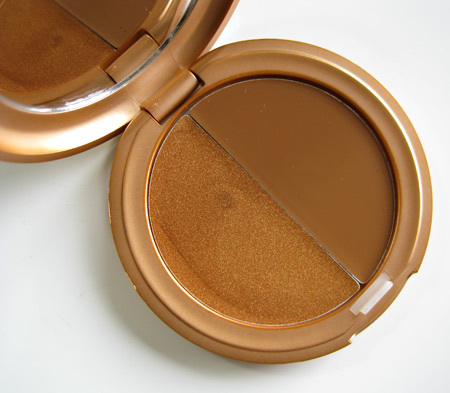 The bronzer end is a warm, matte orangey brown that totally reminds me of a cream version of MAC Saddle eyeshadow. The highlighter is a shimmery coral gold. I layered the bronzer beneath Mango Crush Lip and Cheek Stain on my cheeks yesterday. It was a bit streaky, but the highlighter was a little smoother when I used it on my upper cheek bones. I like the duo, but I think I’ll need a lot of practice with it. Mango Crush surprised me. I’ve tried both of Stila’s other Lip and Cheek Stains, Cherry and Pomegranate, and neither one has shimmer, so I expected a simple orange stain from Mango Crush. Instead, it’s a shimmery, peachy coral. I wore it on my cheeks and lips yesterday and HOLY WOW — a little goes a long way. It looks *very*pigmented on my brown skin. Like the Marigold Convertible Color, though, I can tell it’s going to take me some practice to use it well. Maybe I’ll fall more in love with it after trying a few more application techniques. I really wanted to like the new 24 KT Lipglosses because of the cute caps, but again the decorations break off easily. Some of the little beads fell off in my hand as I held onto the tube. The glosses come with a brush applicator. When you turn the cap, gloss moistens the brush at the tip. I tried Merlot first (a shimmery wine), and the twisty tube worked well, loading the brush with gloss, but when I tried another shade, Brilliant Pink (a shimmery hot pink), nothing happened. I turned that sucker all ways ’till Sunday, but it was clogged or broken or something. I don’t know if it’s poorly constructed or if I just got a rare bad one. 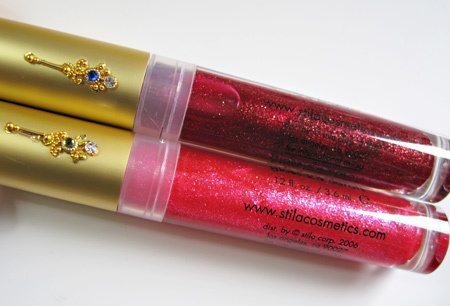 As for the gloss itself, Merlot reminds me of Stila’s Lip Glazes. 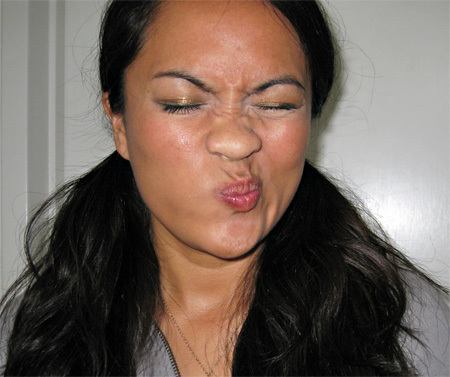 It feels non-sticky on my lips, has medium-to-light pigmentation and smells faintly of vanilla. I like it, but I’m concerned about my tube of Brilliant Pink. I hope the jamming isn’t something that’s going to happen often with these. LOL! I don’t know what was going on here! love this in the pics/descriptions. I just got the pom. cheek/lip stain on Friday and I totally LUV it. I have and love cherry too, so I know I’m gonna need to get my mitts on mango. As for the gloss applicator-is it the same style as the lip glazes and stains? Those twist pens are such a PITA-they drive me so crazy it almost deters me from buying the products. With my brand new pome stain I had to twist and twist and twist…thought the gel was never going to come out, but if finally did. So I guess I would just say twist again? It took me a really, really long time to get the flow going. It’s similar. It doesn’t have the clicky thing on the bottom, but it works the same way. Oh, I think the endless twisting in the beginning is normal. It took me forever and a day to get the Mango going. Did that Sephora open up in your town yet? OMG! New items from Stila :D. I’m in ‘must buy’ mode lol. 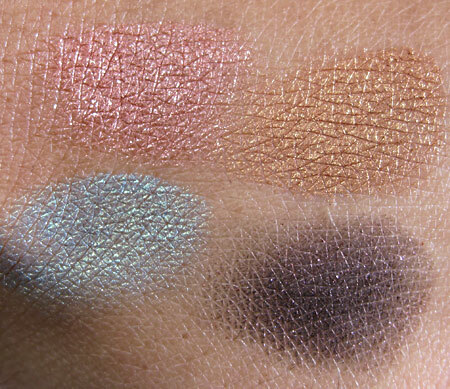 The eyeshadows look great and on olive skin tones they’ll probably make any eye pop! Oh yes! And the pigmentation is to die for. I think lots of peeps will love this collection! aw! ur pics are so cute. i love those indian inspired colours and products. gets me kinda excited since i have brown skin, and golds/jewel tones look best on ppl of my skin colour. thanks for showing it to us! 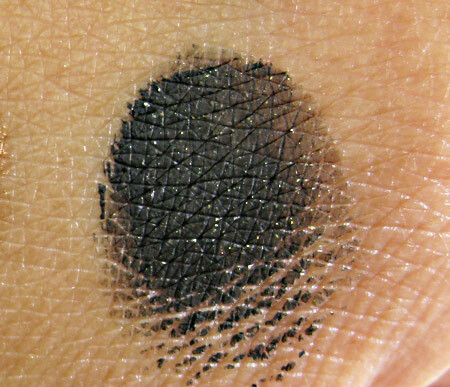 The smudge pot actually reminds me a lot of Clinique’s summer limited edition cream eyeliner Egyptian, which I looooooooove by the way. I think I missed that one. Sounds like it was drool-worthy! Good idea! I used to have a pretty decent bindi stash during my club days… I should see if I can find them so I can stick ’em on this compact. LOL, Karen! I totally watch those videos on Sunday morning too! I also am obsessed with a lot of Bollywood movies. I hadn’t seen any in a while, but then caught “Saawariya” a few months back and got back on my kick. I love the pics of you, too! I’ve never used their smudge pots, so now I’m a little curious. The Stila Smudge Pots are pretty great. They’re like the Benefit Creaseless Creme shadows. I would like to know where I can buy those abs, LOL! Oooh, pretty! 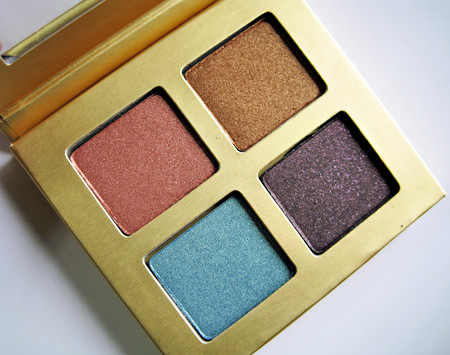 I love the eyeshadow quad, and I’m definitely interested in the Mango Crush! 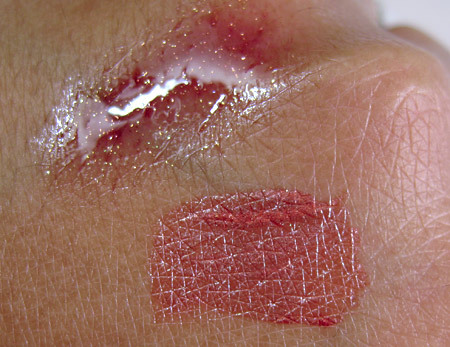 (I already have Cherry, but I’m always up for new cheek/lipstains, especially coral-y ones!) What a fun collection! Yah, the quad is way cute. 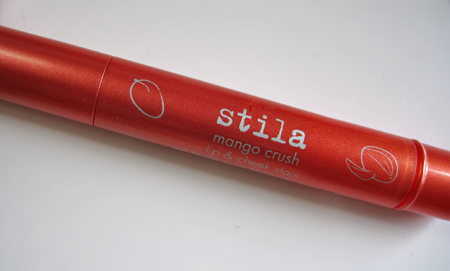 I can’t wait to do some layering with Mango Crush and some Stila Lip Glazes. It’s a fun style! 🙂 I put it in a French braid the night before and in the morning it had all those nice waves. Just put ’em in two low ponytails and you are good to go! that smudge pot looks very pretty! Aww… thanks! It was raining yesterday so I had to get the hair under control before it went full on poooofy. I am definitely getting the Marigold all over color and the Mango lip and cheek crush. 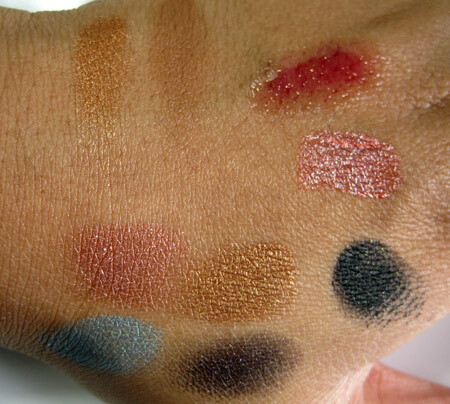 i want the smudgepot sooo badly! if i see another photo of stila’s new collection, i just can’t take it. i’m seriously thinking of getting the e/s and smudgepot. i’m a total sucker for gold shimmer. Do you think you could give us a rundown of everything you have on in that picture? It looks so pretty and natural, especially the eyeliner! That palette looks divine. Awesome colors for summer! Hey Karen! Thanks for the review on everything. I’m going to be ALL OVER this collection when it comes out. Being Indian, I know all of this stuff is going to go great with my skin tone. Plus I’m glad that most of the products are not PINK – everything lately seems to be about pink! Hi Karen! I don’t know what you used for your undereye concealer in this picture but girl, keep using it! I’ve read your blog for years and I’ve never seen your undereye area look so bright! Favorite eyeshadow: Amber Lights over Soft Brown in the crease, really makes Blue eyes pop! Howâ€™d ya sleep last night? Great! Skill Iâ€™d like to learn in the next sixth months: How to pack..
Song stuck in my head: Duffy Stepping Stone..I must of heard it on the T.V.! I think it’s so cool that you are into bollywood! You should note down the song titles you like and find them on youtube – they usually have subtitles for the songs. Also if you like the songs, i’m sure you would love the movies! they all come with subtitles now and you can get most of them on netflix (if not at a local indian grocery store- theyve got dvd rentals). theyre pretty long tho (im sure you’ve heard. about 2.5- 3 hrs)recent movies that i love are: Jodhaa Akbar, Dhoom 2, Khabi Alvida Na Kehna, Khabi Khushi Khabhi Gham, Hum Tum, and Saathiya. All these movies have amazing songs and if you type in the movie name in youtube you will get a bunch of songs. To listen to songs from a specific movie, go to http://smashits.com/music/cat40/hindi-film-music.html . Click the movie and click select all and then play! Enjoy!! Looks great. 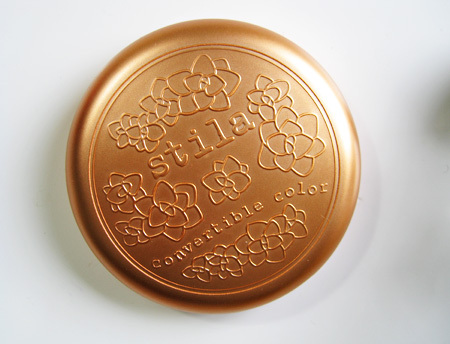 I love Stila shadows, they’re like butter and have great pigmentation. If you are worried about charms falling off your products after you get them and before you use them you can go over them with a little clear nail polish. It’s rarely if ever noticeable and lasts forever on products as they don’t grow/get the daily beating our hands do. 😀 Very helpful for all those cute things that want to fall apart against our wills. I do it with just about everything now, just in case. Also, I blame Slumdog but I’m not complaining, I’m not too much of a color user on myself normally but I’d really like to get these colors! i am dying to get that e/s palette. its gorgeous!!! the mango crush looks awesome too on ur skin. i think i’ll get it too!! once i’m tan this summer… it should look great! i’m soooooooo excited. i want it now! i can’t wait until may. your undereye concealer looks good… what kind/brand are you using?? Just to comment on the collection…as I work for stila…the whole collection is infused with real 24karat gold which is rich in nutrients for the skin, to include the prevention and depletion of collagen in the skin, tightening of the skin, protection against sun damage and help with discoloration. Not only is it beautiful on but you will also have great benefits when you use it…mango crush also has phyto nutrients rich in antioxindants to include vitamin a, b and c!!! Will be available in early May…enjoy. OMG, your hair looks great! Thanks for the shout-out, I’m such a horrible friend, I saw this almost a month later. I apologize for being so distant. School’s been driving me insane!!! You’re the best, and you rock the colors..
No worries, hon. I hope that school has been going well. Get grades and study hard! Oh, btw, do you still work for CK? Karen- where are we writing the bravest thing we have ever done? Anyway, mine is flying in a plane. I am moritified to fly. So when I get in a plane with sedation, it is a miracle. Btw- I just ordered the Ulta summer collection- it looks like the Stila summer collection. I love tjhose colors!